New to our lineup, the Prado Tight Top Plush is becoming a favorite of those who come into our showroom seeking a soft, plush mattress with cooling properties. 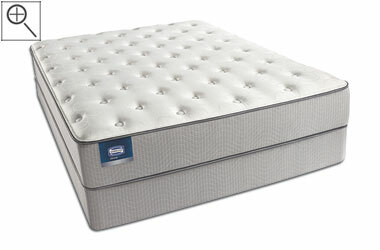 It's very affordably priced - especially for a pocket coil mattress with such a trusted name as Simmons BeautySleep. 700 wrapped pocket coils provide a soft but supportive core and an inch of AirCool Foam allows for airflow so that the bed doesn't transfer as much heat as traditional mattresses. The cover of this mattress has a distinctive silky feel that can aid in overall comfort. A truly plush mattress, this is an addition that is specifically engineered for you, if you like a hammock-like feel. A foam encased outer wall reduces motion transfer from your partner so, your sleep will be less interrupted. Some shoppers seek a lot of 'give' in a mattress and the Prado Tight Top Plush provides just that. The BeautySleep line is a cheaply-priced solution for quality materials and a trusted name. Energy Foam helps to keep your AirCool layer from gradually dipping into the spring unit and adds support. The foam encasement has a nice, dense feel to it and indicates that this is a well-made mattress. This is one of the more simply engineered pocket coil mattresses that we carry and, oftentimes, it's all that you need. If your idea of "plush" is several layers of varied foam being built atop your innerspring unit, you may want to have a look at the BeautySleep Orient Beach Plush Pillow Top Mattress.The Orient Beach offers an additional pillow top and almost two inches more of foam layers between you and your spring.